Acoustisonic 30.. (I know it's not an epiphone amp) Any reviews? 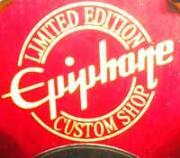 I know it's not an epiphone but are there any epiphone equivalents even to compare? Anyhoo.. Any experienced reviews on the Fender acoustisonic 30? Well, I don't check in here often so here's my take. I have a 20 or so year old Acoustisonic Jr. 40 watts, loud as hell! Use it only with my Ovations, but a nice crisp sound to it. Fender makes great amps, btw, at least IMHO. As for an Epi equivalant, can't help you there. Hope this helps, if not there's always somebody posting something about anything on YouTube LOL.